Supreme Court slammed the RSS Sarsanghchalak, Dr. Mohan Bhagwat for stating that Karakre had told him that he was under tremendous pressure to nail the RSS in unsolved cases of terror acts like, Malegaon, Ajmer, Samjhauta Express blast (Feb 28, 2012). As per the Chief of RSS, he knew Karkare well and Karkare had solicited his cooperation for solving these cases, and in the context of that had told him about the pressures being put on him. One knows that Karkare was under pressure during that time. One also knows that the investigations in the acts of terror were leading nowhere and after every blast number of young Muslim boys were arrested, the blame was put on some affiliate of Lashkar, Al Qaeda etc. After Karkare took over as the chief of Maharashtra Anti Terrorism Squad, the things started moving. The turning point was the meticulous investigation by Karkare’s team which led to the unearthing of the motor cycle used in the Malegaon blast, the motor cycle belonged to Sadhvi Pragya Sing Thakur, the ex ABVP (RSS affiliate) activist, and the leads took the ATS to the whole set of terror group, which were called later as Saffron terrorism by the Union Home Minister P. Chidambaram. These investigations led Karkare to Swami Dayanand Pandey, Lt Col. Prasad Shrikant Purohit, Swami Aseemanand, Indresh Kumar, Sunil Joshi, Kasangra and the number of those close to the RSS or close to RSS affiliates. The implication of this was very clear. Once this Hindutva network got exposed the acts of terror which were occurring at regular intervals in front of mosques and other places, where Muslims congregate for prayers came to a halt. As such it was ironical that the blasts were focussed to kill the Muslims and after every act again Muslims were arrested. With the Rajasthan ATS joining the process of investigation the evidence against these Hindutva elements became further clear. The confession of Swami Aseemanand in presence of the magistrate gave the full details of the modus operandi of these acts of terror. The people involved in these acts believed that they are doing these dastardly acts to avenge the Muslim terrorists and that these acts aimed to pave the way for Hindu Rashtra. Swami Aseemanand, the VHP leader working in Gujarat, who was the architect of Shabri Kumbh Mela was the key figure in these blasts in many ways. In the statement given by him in presence of the magistrate he confessed that their group was involved in these activities. Since then more and more beans have been spilling from the Sangh stable, the latest one being that of involvement of Kamal Chauhan in Samjhauta blast. Chauhan has been labelled as the disgruntled element by his parent organization, RSS. This again is the standard ploy by RSS. Most of those who are caught doing these acts of murders or blasts are claimed to have left the organization some time ago or if possible their association with RSS combine is put under the wraps. One recalls that there was a time when nobody believed that RSS associates can be part of these acts of terror. RSS claims they do not believe in violence. Their claims have come to be exposed one after the other. Now their claim is that they are being implicated by the ruling party to appease the minorities; or that those being charged for acts of terror are clean people and are deliberately being implicated in terrorist acts. Going by the expose after expose, the RSS at one level is trying to disassociate from these terror accused, on the other is propagating that they are accused but not guilty and on yet another level claiming that the investigation authorities have been pressurized to nail the RSS cohorts. This defence is very weak. The statement of RSS Chief is coming at a time when Karkare has already become a martyr for the cause of defending the country. There is no way he can confirm or deny what the patriarch of Sangh Combine is saying. But yes there are some clues which can tell as to what is the truth. Lets recall that Sadhvi Pragya Thakur was caught for her alleged role in Malegaon blast, none other than Lal Krishna Advani went to the Prime Minister to complain about the torture of Pragya Singh Thakur and demanded investigation into Thakur's torture. At the same time another Hindutva leader Bal Thakre condemned Karkare, calling him anti National and wrote in his mouth piece Saamna that ‘we spit on his face’! 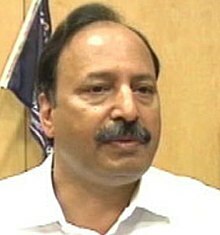 Another Hindutva warrior Narendra Modi called Karkare as Deshdrohi (anti National). Incidentally both these, Thackeray and Modi, are hailed as ‘Emperors of Hindu hearts’. Later Modi called Karkare as a great patriot after his death. Modi went to the extent of offering one crore Rupees to Karate’s widow, which she gracefully refused. On the contrary Congress leader Digvijay Singh claimed that Karkare had called him on the night of 26/11, the day Mumbai was attacked by Kasab and gang, and said that there is a tremendous pressure on him from the Right wing. Digvijay Singh also showed the press clipping to that effect and pointed out that BSNL, Bhopal cannot give the records of the conversation between him and Karkare as the matter was more than a year old at that time, and BSNL does not keep record beyond a year. There is another source which tells us the direction from which Karkare was being pressurized. Julio Ribeiro, one amongst the police of officer of highest integrity in the country, in his obituary to Karkare (Times of India, Mumbai Edition 28th Nov 2010) pointed out that there was a direct insinuation into the work of Karkare, who was intimidated by Advani and other Hindutva gang. Karkare sought solace and advice from his senior Ribeiro, Ribeiro confirmed that Karkare was being harassed and intimidated by the associates of Advani-Modi and company. Ribeiro advised his junior colleague to carry on with his work irrespective of the pressures. "He came to me because he was looking for someone to hold his hand," Ribeiro told IANS on phone from Mumbai while stressing that Karkare was not a man to be politically influenced. While this is what the truth is, one can see the motive behind Bhagwat’s statement in the face of so many of his cabal either charged or in jail. In an earlier event Bhagwat’s predecessor K. Sudarshan had also played a similar game. During the investigation of Babri demolition, when the role of RSS combine was coming more and more to surface, Sudarshan said that he heard Gandhian Nirmala Didi saying that there was a blast inside the mosque which demolished the mosque. Fortunately Didi was alive that time to deny something being said in her name. So there is some pattern in the statements of RSS chiefs!